View - 317 S Hancock St.
3 bedrooms and 1 full bathroom. Large covered front porch. It also includes a formal dining room. The kitchen has a built in breakfast bar and a bench. Off of the kitchen is a large walk through pantry. The back yard is completely fenced in and has a storage shed. 1 car detached garage has a work shop. The garage has had a new roof put on summer 2008. 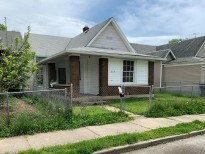 This Rent To Buy property has a sales price of $75,900.00 with $300.00 down and $679.00 monthly. The Term is 30 years which includes a 2 year probationary period as "Rent" or "Rent To Own". The remaining Term (28 years) are under a Land Contract at a fixed rate of interest (9.65%). There are . . . NO "pre-payment penalties" . . . NO "balloon payments" . . . NO "adjustable rates" or ANY "adverse conditions" to make you lose your property. Taxes ARE included in payment. The only way you will ever lose your home or property... is if YOU don't make your payments. All properties are offered in "AS-IS" condition to be used as investment income properties. Properties may not be rented, lived in or used as a dwelling until property is brought up to minimum habitability standards. Buyer agrees to pay the cost of all repairs and maintenance.